Along with the merriment and joy, Christmas, for many, is also a reflective time of remembrance for those who you can't be with or are no longer with us. In terms of this sentiment, the latest production from the Royal Shakespeare Company (RSC) in Stratford upon Avon may leave you a little morose, but its a touching, heartfelt piece of theatre that often leaves a lump in your throat for all the right reasons. 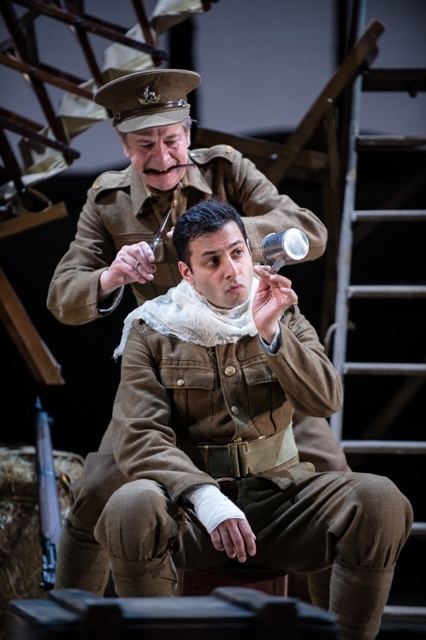 The Christmas Truce is a tender touching tale from the RSC. 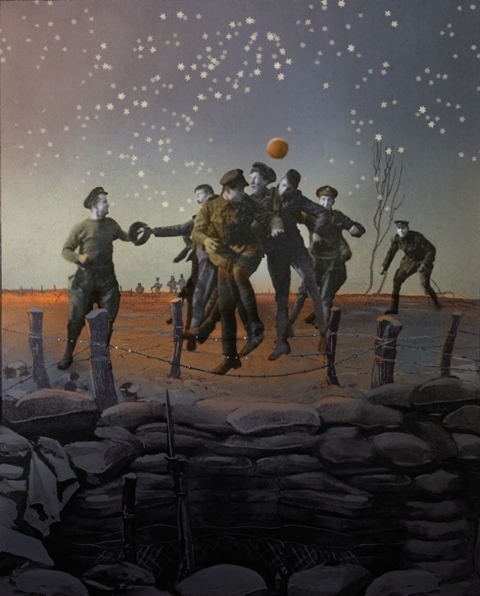 Set during the first Christmas of the First World War, The Christmas Truce takes inspiration from the real-life story of a temporary truce when British and German soldiers made an improptu meeting on no man's land to swap gifts and play football in 1914. The play even features The Wilfred Owen Violin, made to commemorate 100 years since the start of World War One. It has been specially written by Phil Porter (who is behind the RSC's excellent recent version of A Mad World My Masters) and manages to perfectly balance the comic jibes between comrades in the Warwickshire Regiment - in the vein of Dad's Army - with the gloom of the trenches and ultimately seeing the enemy as real people. 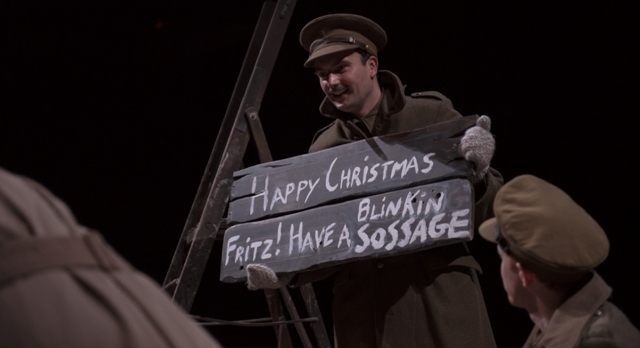 Camaraderie in the trenches provides wonderful comic scenes in The Christmas Truce. Taking the audience on a rollercoaster of emotions, we start off on a glorious summer's day in an English cricket field where our team of players are about to get into the ultimate sticky wicket of war. This cricket theme cleverly runs through the whole play, with the scoreboard meaning far more than runs and overs and fallen soldiers seen bowling off into the cricket team in the sky. It's a touching and less gruesome way of dealing with the casualties of war. After all, it is Christmas. From enrollment to going 'over the top' of the trenches into battle, we follow the Warwickshire band of brothers and quickly get to know their traits and loves through haircuts and meal times, making it even more devastating when some of them are lost. And when the German soldiers make an appearance, Porter has made efforts to make them likeable and show how all our soldiers are just players in a far bigger game of football, far more deadly than the humorous game they play together. 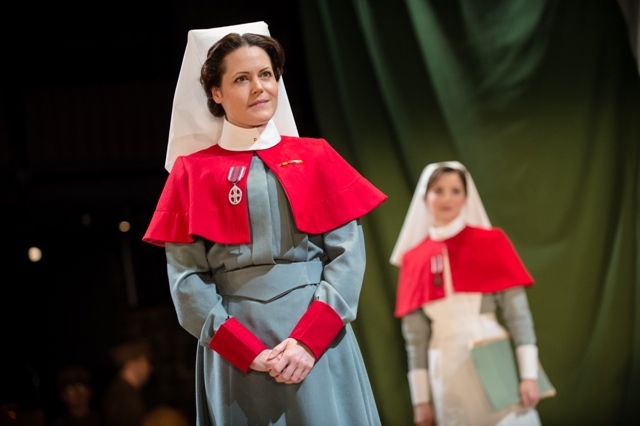 Aside from this main story is another battle but this one of wills between an enthusiastic new nurse and matron at a clearing hospital near the frontlines, both played passionately by Frances McNamee as the apprentice and Leah Whitaker as the stone-faced matron. It's not all wartime gloom, however, as there is a gleam of constant radiance from the humour and live music - the banter, the army bands at the side of the stage, the many carols and the merriment of the Christmas show put on for the troops. The writer has also cleverly weaved in another real-life element by making Captain Bruce Bairnsfather one of the main characters. Bairnsfather was one of Britain's most popular wartime cartoonists, whose humorous impressions from the frontline featured the 'Old Bill' character - Old Bill of which even appears in this play. An exhibition showing Bairsfather's wartime cartoons and life story can even be viewed on Level 2 of the RSC Theatre in the PACCAR Room, and is well worth a view to add another depth to the play. 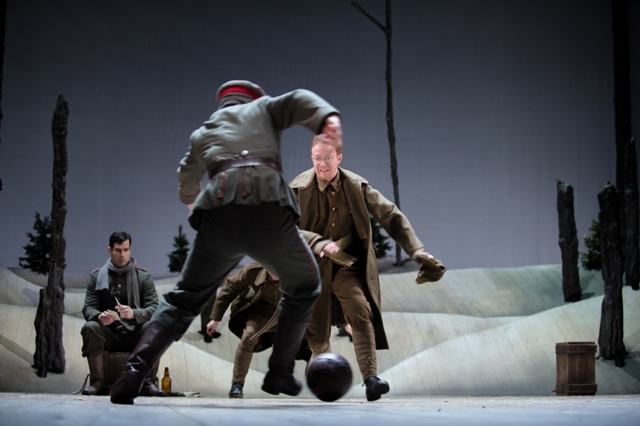 The Christmas Truce is a sentimental, heartfelt play for the festive season with a difference. It touches on goodwill to all men but also reminds you of what has been won and lost in another fitting performance during the First World War anniversary year. Tickets cost £8 to £57.50 and are available by calling 0844 800 1110 or from the RSC website.